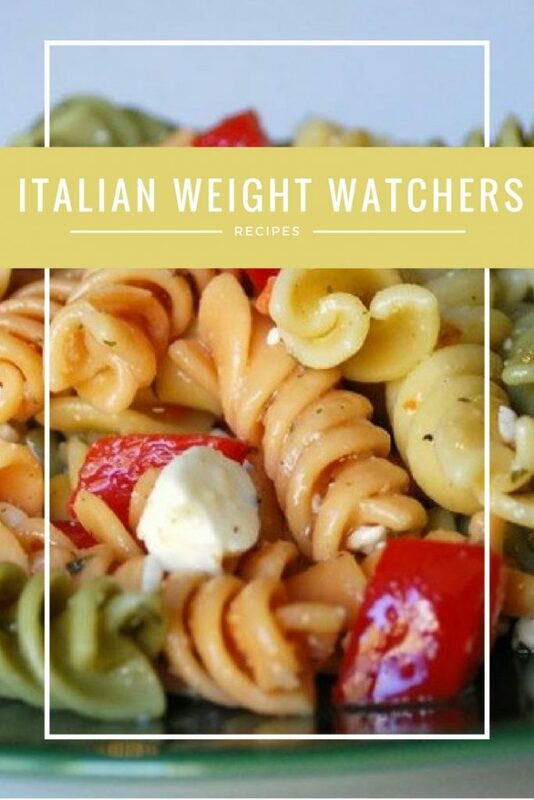 Who knew there were so many delicious Weight Watchers recipes for Italian? I know, especially when you’re on a diet, Italian food feels like taboo, doesn’t it? But it doesn’t have to be! With these delicious Weight Watchers recipes, you can stay on the plan and truly enjoy what you’re eating. I’ve only been to Italy once, about ten years ago. Though it was wonderful to meander the streets and take in the history and architecture, it was the food that I remember the most. I had hoped we would get back this year for our summer vacation as we had been talking about a Rome to Positano trip. We waited to long to book and ended up in Belize instead. We had a blast, but I’m really hoping for Italy next year! Being able to eat foods from all over the world is an amazing thing, and though you won’t have those views, everyone loves Italian food! Eating a big Italian dinner together just feels right, doesn’t it? Italian makes a perfect weeknight meal, and your family will never know these dishes are healthier for them than the typical fat-laden recipes. Being on the Weight Watchers program doesn’t mean you have to miss out on any cuisine. There are so many Italian Weight Watchers recipes that work for the program. Now you can enjoy Italian food and get to that goal weight, too. Always check your point balance and stay within that range! Below are some of my favorite Weight Watchers recipes, Italian style. Bon Appétit! Pizza Salad Recipe | Food, Fun & Faraway Places | This delicious pizza salad will give you your pizza fix without all the fat and calories. That’s a win-win for me! Deep Dish Pizza | Make Recipes Now Deep dish pizza is so easy to make, you may never order pizza out again! Make an extra and freeze it for later. Lasagna Pasta | Recipe Diaries Lasagna is one of those recipes that you would think you’d have to say no to when eating Weight Watchers meals, but this one is really delicious and works perfectly with the plan. Chicken Parmesan Stuffed Shells | Emily Bites Many people make cheese stuffed shells, but adding chicken adds protein and means you’ll need less cheese which equals less fat and calories. Eggplant Parmigiana | Food | Most of the time, the eggplant in this dish is fried. Baking the eggplant and adding part-skim mozzarella saves a whole lot of fat grams and calories. Stromboli | Amazing Weight Watchers Recipes | This is another one that I would make extra and freeze. It’s so easy to pull it out of the freezer and pop it in the oven. Italian Stuffed Peppers | Best Home Cooked Recipes | I used to make stuffed peppers a lot, but my husband doesn’t like them. I think I’ll have to make a batch just for me! These freeze well, too. Cheesy Baked Tomatoes | Laaloosh | These make a wonderful side dish to the meatballs below! Cheesy Chicken Spaghetti | Living A Changed Life | Everyone loves spaghetti, and this one will be a favorite in your house. Italian Salad on a Stick | Skinny Kitchen | This is a fun recipe to make. Get the kids to help. It’s a pretty presentation, too. Serve it at your next party or take it to book club! Spinach lasagna Rolls | Skinnytaste | Lasagna rolls are a little more work, but I think they’re worth it. Italian Meatballs | STL Cooks | Make a few batches of these meatballs and you can have them with pasta or veggies the first night, and have open-faced subs the second night. Be sure to count all the points. Chicken Angel hair Pasta Bake | A Moms Take | Baked pasta is wonderful for a potluck or a night when you don’t want to work too hard. Cheesy Meat Lasagna | iSave A to Z | Another version of lasagna. You can’t have too many! Italian Turkey Meatballs | Cookin’ Canuck | We make turkey meatballs all the time. We have them with a salad and veggies and then much on them for the next day or two. Always make extra meatballs! Skillet Chicken Parmesan | Marlene Koch | I love that this recipe is made in one skillet for easy cleanup. It’s delicious, too! Looking for more Weight Watchers recipes? Here’s a roundup of 20 Delicious pizzas, all perfect for Weight Watchers meals. Rather have Asian? Check out these recipes for Weight Watchers Stir Fry. And if you have Amazon Prime, you can read the brand new Weight Watchers 2018 Super Delicious Italian cookbook free (just $5.88 if you don’t have Prime!) Rather have a real paper book on hand? Check out the Weight Watchers One Pot Cookbook. I love easy! Hi Brigitte – I gathered these recipes from sites that feature Weight Watchers. You can print from each site, but I know that’s a pain. I just updated the post with a few options. Hopefully, you will find something you like. Thanks for taking the time to visit. I appreciate it and would love to have you as a new subscriber! Have a great rest of the weekend!